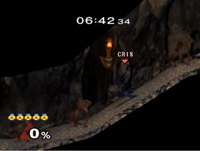 The Underground Maze is the third level of Adventure Mode in Super Smash Bros. Melee. It is based on The Legend of Zelda series. The fighter's goal in this stage is to find the Triforce. The Triforce is hidden in one of five Battlefield-like areas in the maze. The artifact's location is random each time Adventure Mode is played. If the fighter comes across a battle area without the Triforce, he or she will have to fight Link and may not leave the area until the Hylian is KO'd. Fighters must also watch out for ReDeads, Octoroks, and Like Likes. Once the Underground Maze is completed, the fighter will journey to the Temple to do battle with Zelda. This page was last edited on June 17, 2018, at 22:49.